A friend of ours, Shohei Takatsu, stayed with Devin and I in Minnesota for a few months last year to learn English. 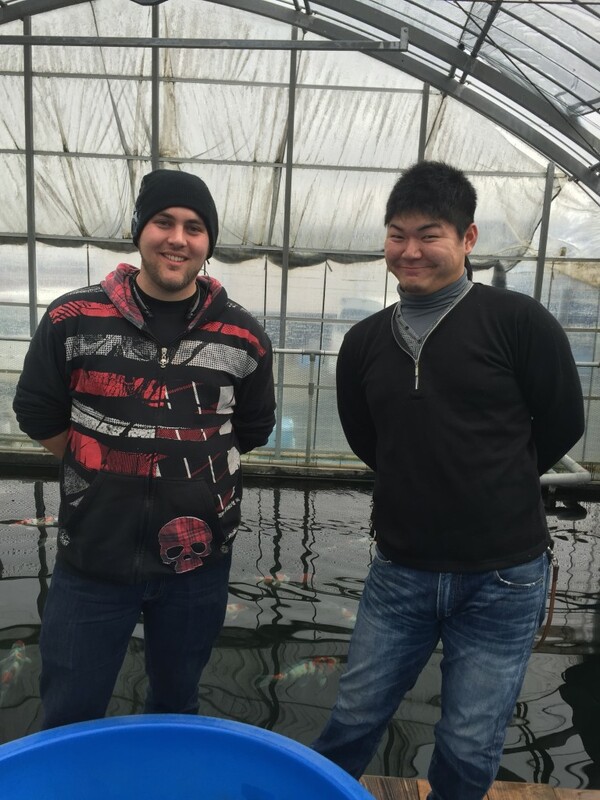 He began working at Marudo Koi Farm shortly after Devin returned to America and that’s where we had met him. We had become quite close to him and before he left, we promised to visit him at his farm in Fukuoka one day, and that day had come. Fukuoka is about 200 or so miles from Matsuyama, but unlike America, Japan isn’t just one continent. 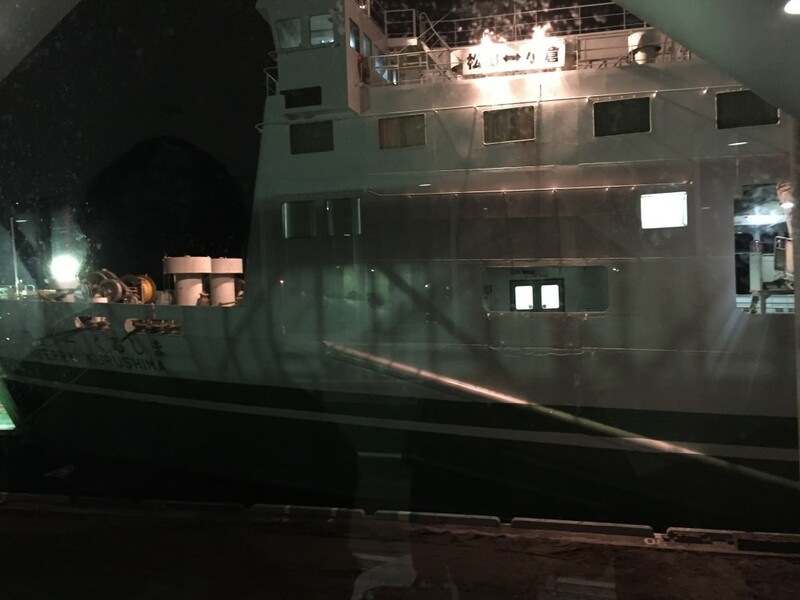 Taka from Omosako Koi Farm suggested that perhaps the quickest and best way to get to Fukuoka would be to take an overnight boat to the island. How exciting! When we got to the gate to board our boat, we were all quite impressed with how large the boat was! There was enough space for about 10 containers in the bottom deck and several cars to board the boat. I shouldn’t say it was a boat, because it was actually more like a ship! I was very grateful for its size because I have a tendency to get motion sickness and since it was so large, I didn’t get queasy at all. Check out our room: (see Devin doing a creepy face in the bathroom? lol) It was pretty sweet and had all the comfort an amenities of a standard hotel. This is definitely one of those things I wouldn’t mind experiencing a second time. We arrived at Fukuoka at 7:00 am, and Shohei was there to greet us bright and early! After a few hugs and a bit of catching up, we headed out to grab breakfast. It was so nice to see him again after nearly a year, and I’ve always enjoyed his bright and cheery personality. Since we had traveled a long way to get to him, Shohei had made arrangements to visit another farm in addition to his own. 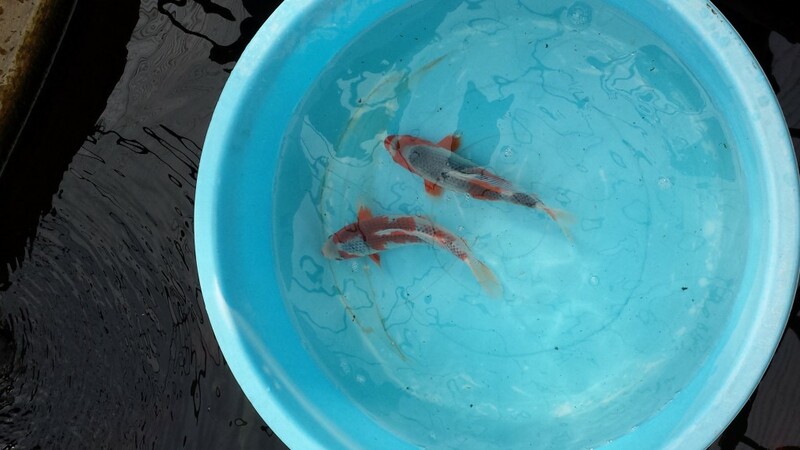 First stop on the itinerary: Ueno Koi Farm. This farm has been gaining attention for their impressive Showa, and what greeted us when we arrived lived up to it’s reputation and more. 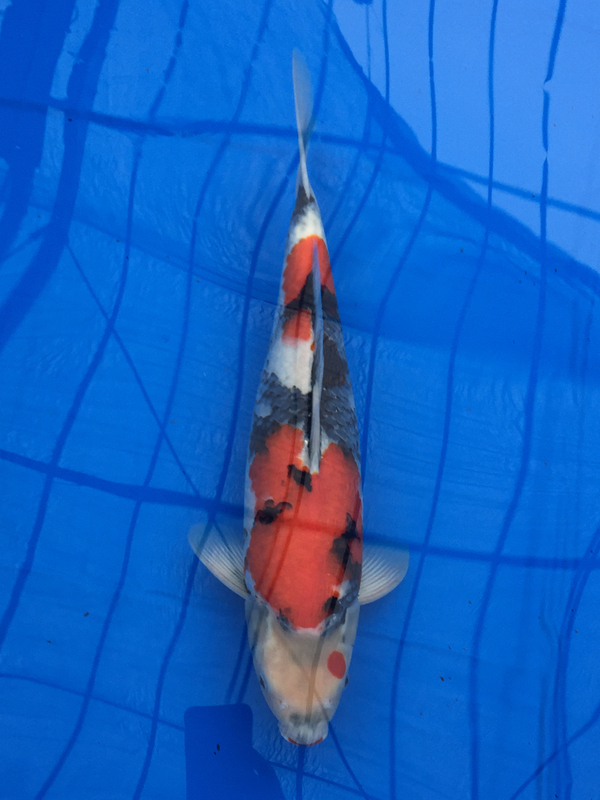 Try as I may, I couldn’t seem to get a good photo of the Koi in the tank due to glare and this photo doesn’t really capture how beautiful these Tategoi Nisai Showa were. 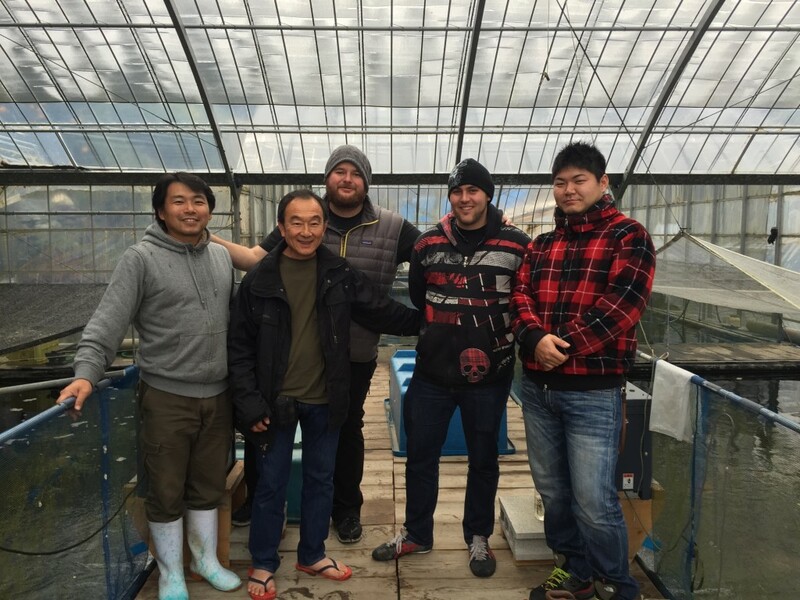 After everyone had completed their selections, we headed out to lunch, then headed back to the city for some much needed R&R before heading out to Takatsu Koi Farm the next day. 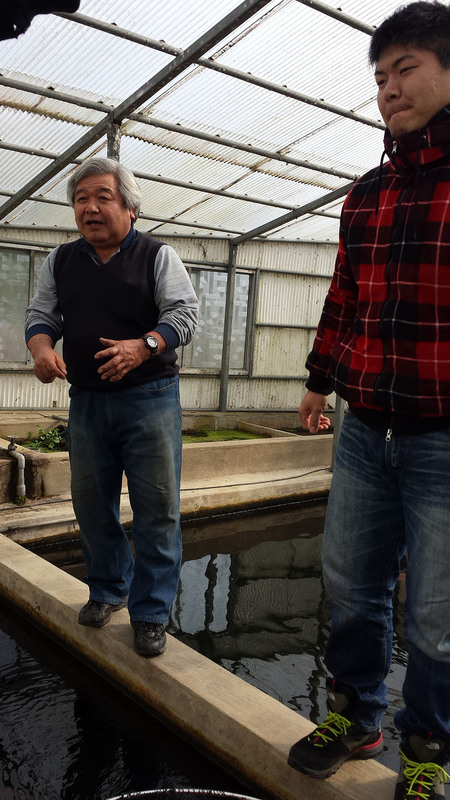 The next day we pulled into Takatsu Koi Farm and were greeted by Shohei’s lovely parents. He took us around his facilities, which was much larger than we thought it would be. The weather in Fukuoka is a lot more forgiving than it is up north, and they don’t really have much snow to contend with. 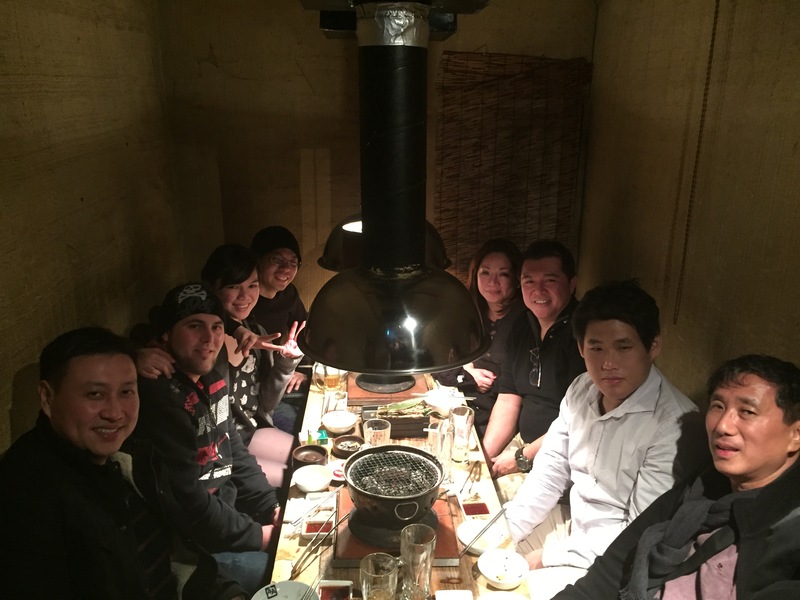 Shohei’s part of the prefecture was a quite area where most people knew each other. 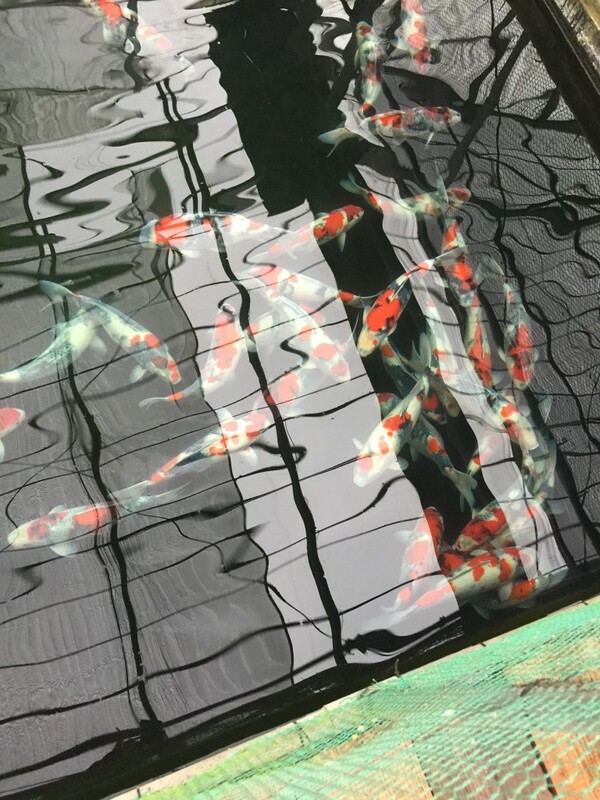 As is typical for a visit to a Koi Farm, you spend a lot of time sitting down and chatting over tea with your hosts. The Japanese people really like to take the time to know their guests and find out how they are doing. 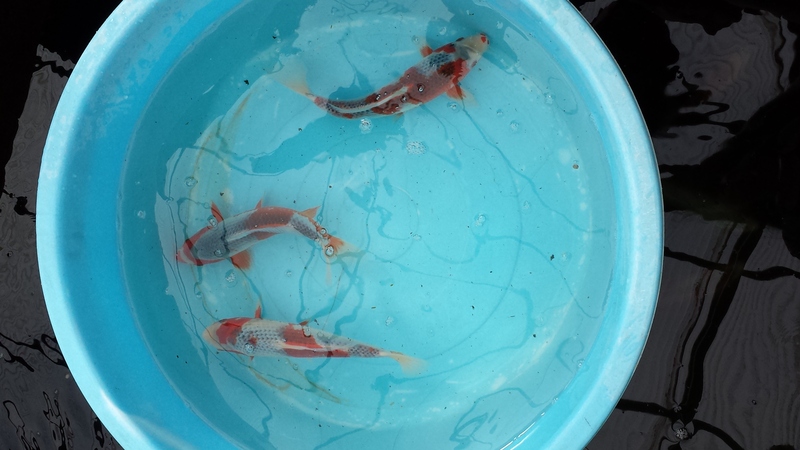 Naturally, in my experience, the conversation almost always revolves around Koi. Isn’t it interesting? They look like Asagi Goshiki! That afternoon, we headed on back to the airport and took a plane ride back to Tokyo. 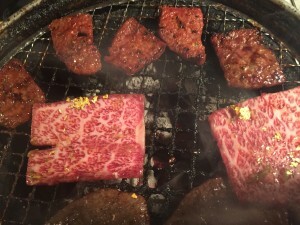 For the next few days we got some time of to rest and recuperate before the All-Japan Show. Devin and I had a lovely time going around Tokyo and by Thursday night we met up with my parents, my brother and some of our friends from the Philippines. Yakiniku for dinner! 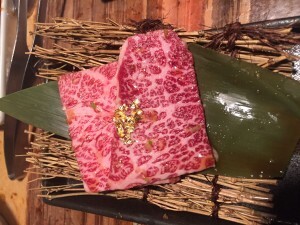 Have you ever eaten gold leaf? Well, this restaurant was serving it on top of super marbled beef and I have to say now my stomach contains gold!